If you’re experiencing symptoms or discomfort, fast chest pain treatment from board-certified physicians is available at The Emergency Center. Each of our fully equipped, free-standing emergency rooms – including our Fort Worth, Arlington and San Antonio, Texas facility – features the same capabilities as a traditional hospital ER, minus the hectic atmosphere and often lengthy wait times. 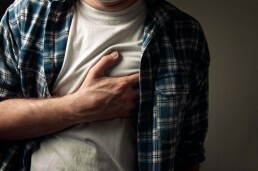 Is it a Heart Attack or Cardiac Arrest? While not all chest pain symptoms are indicative of a heart attack, cardiac arrest, or other heart-related emergency condition, there is often no way to know without visiting a physician. As a patient at The Emergency Center’s Fort Worth, Arlington and San Antonio locations you will receive prompt chest pain treatment from a team of board-certified physicians and ICU- and ER-trained nurses. Our facility is equipped with advanced diagnostic technologies that streamline care, including a high-resolution, 64-slice CT scanner that is used to quickly evaluate coronary arteries and could help avoid unnecessary hospital admissions due to heart attack and determine your risk for coronary events now and in the near future. Cardiac evaluation and monitoring is also provided to ensure your heart is in good health. In the event of a heart attack or cardiac emergency that requires surgery, The Emergency Center will stabilize your condition and coordinate expedited transport to the nearest hospital operating room. Visit The Emergency Center for fast, comprehensive chest pain diagnostics and treatment. Our Fort Worth, Arlington and San Antonio, TX location is open 24 hours a day, 7 days a week, 365 days a year.